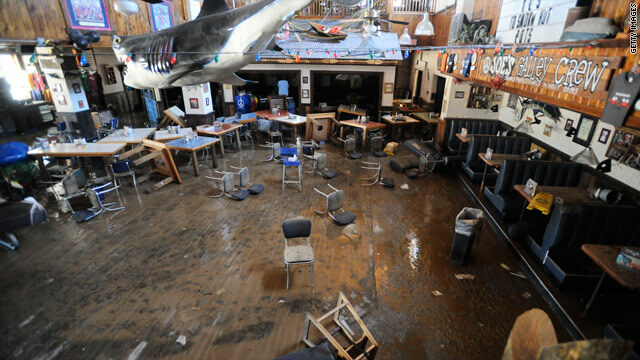 Floodwaters from weekend storms damaged restaurants such as Joe's Crab Shack in downtown Nashville. City House chef Tandy Wilson says, "A good hot meal makes a lot of things better"
(CNN) -- Nashville chefs have cooked up plans to keep rescue workers fed and farmers in business and to whet the appetites of tourists to return once floodwaters subside. "I grew up with the philosophy in my family that when you have a tough time in whatever area of life, a good hot meal makes a lot of things better," said chef Tandy Wilson of City House restaurant. Though his restaurant was stocked and operational and had planned a "flood menu," his difficulty in getting to the building spurred Tandy to shut down his business and rally his staff to volunteer. "We got in contact with the Red Cross to see who we could feed. David Lipscomb University had a big shelter in their basketball gymnasium, and we took over homemade bread and pasta with a pork ragu -- it was real good," said the fifth-generation Nashvillian. But as soul-satisfying as that meal was, Tandy and his fellow chefs knew that with other restaurants having lost inventory and equipment and with the Nashville Farmers' Market under water, there was much more to be done. "We've already got seven or eight of what I consider to be the best chefs in Nashville, and we've all agreed to get together and do a couple of events. We're in the process of putting together a carnival to benefit the market," Tandy said. "There are good people and good restaurants there." He added, "It'll be fun -- something for everybody. It won't be a formal thing -- no white tablecloths. We'll be making corn dogs, which I think will be awesome. We're all going to auction ourselves off to a dunk tank." An alternate location is being scouted for this weekend's market, but the future of farms such as the popular Avalon Acres, which are involved in Community Supported Agriculture -- a plan by which consumers "share" in a farm's crops and receive produce in return -- is impossible to predict until the flooding fully subsides. And while local support is crucial for rebuilding community, it's visitors' dollars that keep Music City humming along. "The one thing that's very important to Nashville is tourism. The honky-tonks on Broadway got hit pretty hard -- and that's not just a tourist activity. It's something I try to do. It's good music, it's a good time, and it's a good fried bologna sandwich. It's a community, and we'll always be here to point people in the right direction," Tandy said. He added, "It's going to take a little time to take us back to where we need to be, but don't take us off your radar." Kristin Whittlesey, assistant features editor at The Tennessean, agrees. "The response from local chefs has been remarkable," she said. "We're getting together resources that people in Nashville can participate in -- all or portions of proceeds from your restaurant check, donating meals to people who can prove they've been volunteering." Whittlesey added, "The Country Music Hall of Fame and the downtown Hilton both reopened [Friday]. Our bars, restaurants and hotels are open and ready to serve, so please come see us and spend money with our local businesses." With major attractions such as the Grand Old Opry House potentially in need of major repairs before they can reopen and the Schermerhorn Symphony Center's loss of Steinway grand pianos and damage to the pipe organ -- restaurants are going to become a major draw for the music-centric city. Tandy said he is confident that Nashville will rally, and he's ready to feed any comers. "This is my favorite city on the planet. We have a community here that will come together and work, and at some point we have to return to normalcy," he said. "If that means we open our doors and 10 people come in or 150 people come in, we're going to try to get things back to where we were."